Pre-qualification is a simple, fairly quick "dry run" of the loan application process. The lender will take the details you provide about your credit, assets, income and debts to arrive at an estimate of how much mortgage you can afford. This process may take only minutes or a few hours at most, and is free! A pre-qualification is non-binding to the lender (because the information you provided has not been verified), it serves as a great indication to sellers of your creditworthiness. A lot of sellers in today's market WILL NOT accept an offer without at least a pre-approval letter. If you are serious about buying, this is the first step towards getting a new home. Applying for a home loan in Monroe LA is quick and easy, Contact Us for more information! It's been an amazing 2017, and we're kicking off 2018 with a new internet presence. Welcome to the new Harrison Lilly Team internet home! We've scoured the internet in search of the most optimized, easy to use, and fastest website so our clients, and viewers, will have a top-notch experience when searching for homes. Even if you're not our client, our hope is that we can help you in some way. 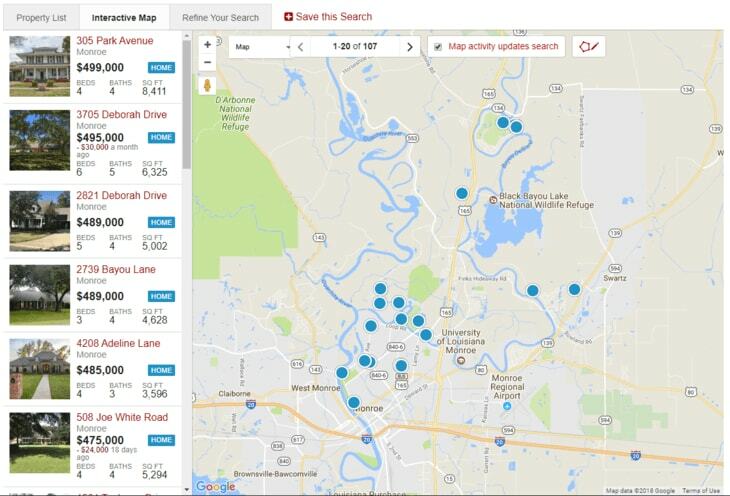 Whether it be with market reports, polygon map search, or a specific neighborhood search - we have it covered. At The Harrison Lilly Team, we're all about Real Estate That Changes Lives, from buying and selling homes to your internet search experience. If you have any questions, don't hesitate to Contact Us! 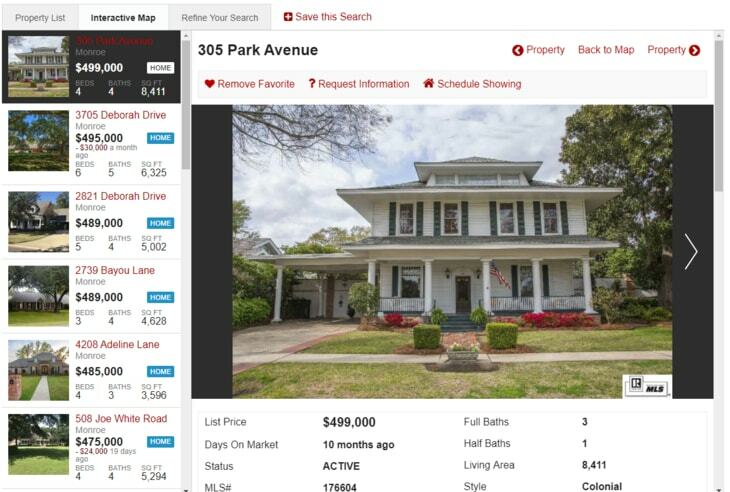 Monroe Louisiana MLS update every 15 minutes - we like to keep it fresh! While Zillow.com or Realtor.com are sufficient for most people, our search is perfectly optimized for the local buyer or seller! A couple of areas where we shine is the specific parish, neighborhood, and school zone focused search. From any page, you can click the Advanced Search link at the top to start a search. When viewing the results of your search, feel free to save the search, add to your favorites, request more information or switch to interactive map mode! Saving a search helps us to see what areas and price range you are interested in. When you click "Save this Search", you can give it a name and a frequency of when you would like updates. When something changes in this search we will send you an update! Our interactive map mode is optimized for easily moving around the map so you can look at property details instantly without leaving your search. When you click on a property on the left hand side, or on the map - the details pop up instantly. From here you can view, favorite, schedule a showing, and return back to map mode - easily, quickly, and without leaving the map. Clicking on a property brings up the detail view instantly. View the details, next property, previous property, favorite, request information, schedule a showing, or click Back to Map to return to the map view. If you want to keep tabs on what the market looks like in a specific area, create a custom market report, save it and have it sent to you at regular intervals. 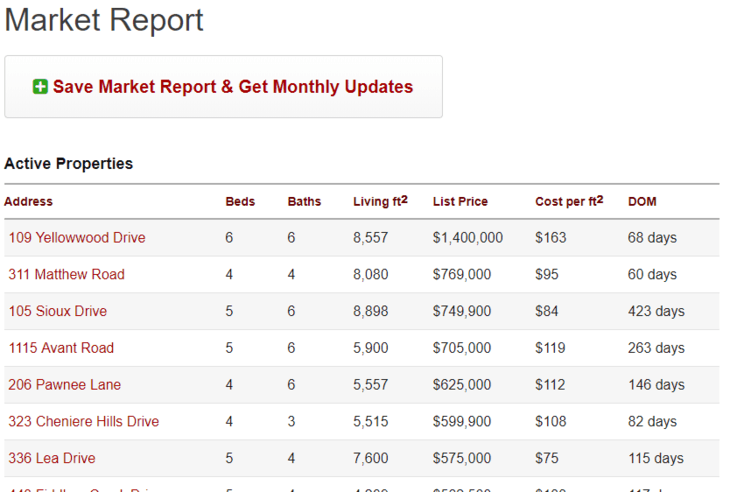 Click the Market Reports link in the top menu to get started creating your custom market report. After clicking Go to Market Report, you can view the results of all the houses that are active or have been sold in your area. From here, you can click Save Market Report & Get Monthly updates to save it for viewing later, or to subscribe to updates. That's it, you have now given your market report a name and a frequency to receive updates. Watch your email inbox for updates! While we could cover every feature in this post, the site is laid out in such a way that it should be easy to figure out (if it's not, please let us know!). We hope you enjoy our new home on the internet! If you have any questions, comments, or concerns, feel free to Contact Us!